Complete solutions for meat, sausage and plant-based alternative. Hamburg, March 2019 – Today’s consumers think nothing of eating meat or sausage one day and plant-based alternatives the next. Meat producers are adding vegetarian and vegan products to their product lines, but regardless of whether they are meat or meatless, foods can be successful only if they have the taste and texture consumers want. That’s where Hydrosol helps. This provider of all-in solutions for meat and sausage products and vegetable-based alternatives is presenting its expanded product range for industrial and artisan producers at this year’s IFFA. Solutions range from stabilisation and texturing, to seasoning and freshness preservation, to sausage casings and breading, with the focus on plant-based trend products and “free from” solutions. Current consumer trends show that plant-based alternatives remain a topic of great interest, in part because they have clear advantages over meat in terms of sustainability and animal welfare. Accordingly, Hydrosol is continuing to expand its range of plant-based vegan products. One example is the HydroTOP VEGAN SF series. This allergen- and soy-free system based on potato and pea protein helps manufacturers make a wide range of products, from cold cuts and salami to bacon. The system also makes it easy to produce plant-based snack foods. This lets food manufacturers meet the rising demand for healthy, good-tasting snacks and position themselves in a further growth segment. 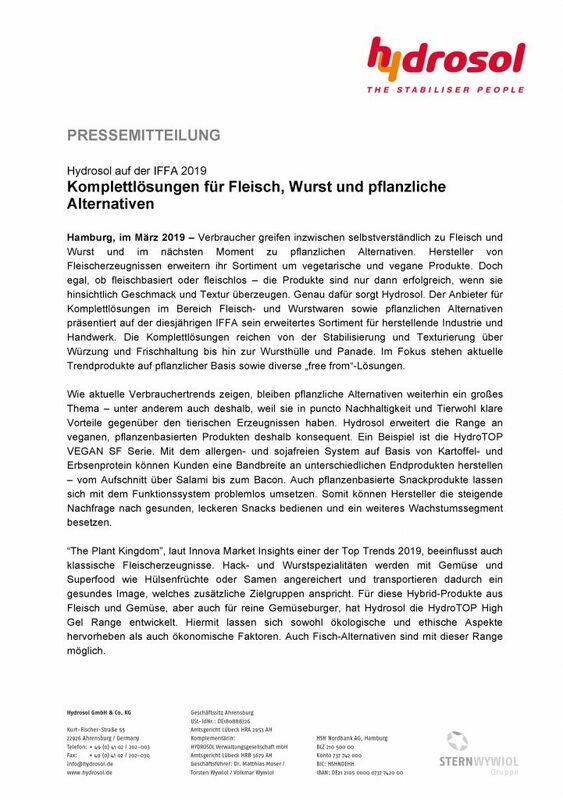 “The Plant Kingdom” is one of the top trends of 2019 according to Innova Market Insights, and is also influencing conventional meat products. Ground meat and sausage specialities enriched with grains and superfoods like legumes or seeds have a healthy image, and appeal to new target groups. Hydrosol has developed the HydroTOP High Gel range for these meat and vegetable hybrid products as well as for all-vegetable burgers. It lets marketers emphasise ecological and ethical benefits, along with economic advantages. The High Gel range can also be used to make fish alternatives. Another plus point is that the High Gel range simplifies the manufacture of reduced-fat products, addressing another strong trend that has high social relevance given the drastic worldwide increase in obesity. Along with fat reduction, salt reduction is also becoming more and more of an issue. 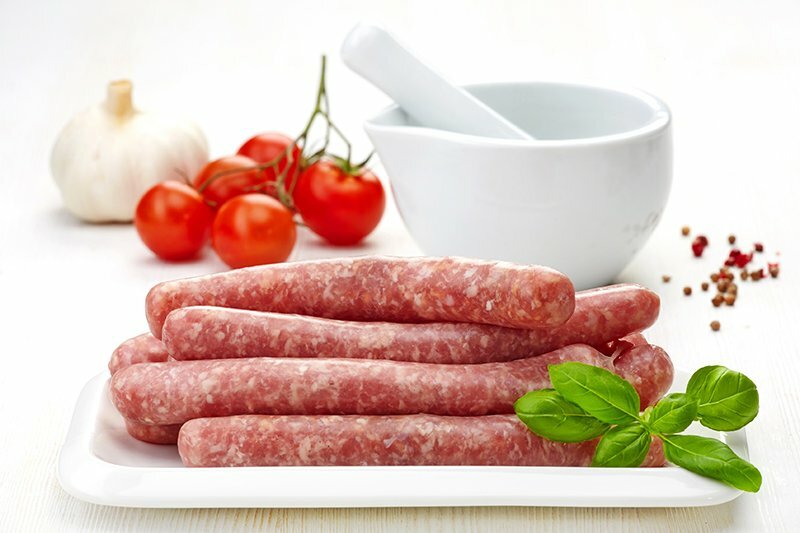 Hydrosol has developed functional systems that enable the manufacture of sodium-reduced sausage and red and white meat products. The company is also presenting new developments for freshness preservation. IFFA visitors can learn more about these and other highlights of Hydrosol’s portfolio at Booth B 81, Hall 12.1. Smart sausage casings for authentic flavour. Hamburg, February 2019 – According to Innova Market Insights, snacking will continue to be one of the leading trends in the food industry. For example, 83 percent of millennials snack instead of eating big meals, due to time constraints. 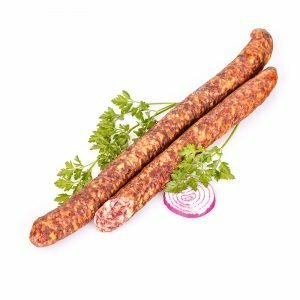 Sausage is a classic snack, whether as hot dog, currywurst or salami stick, whether meat or plant-based. 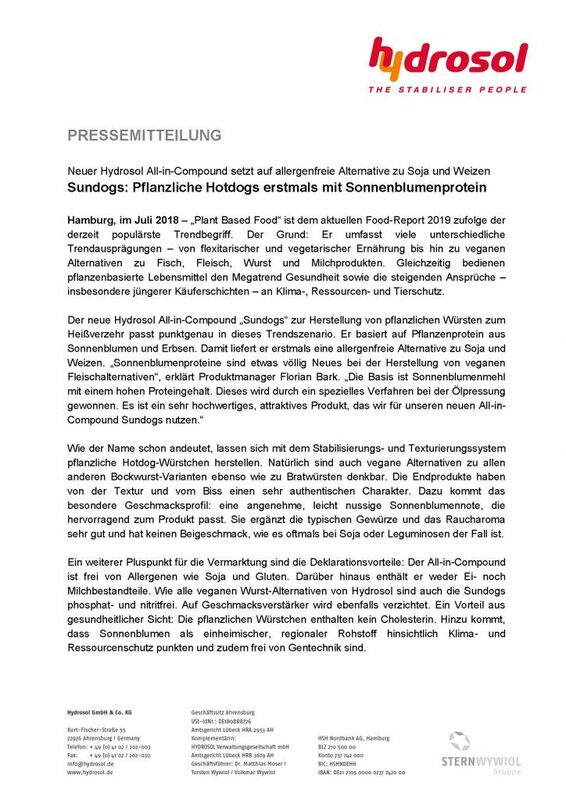 Hydrosol has developed the perfect casing for all these sausages – SmartCasings based on alginate. By means of co-extrusion sausages can be made in all standard sizes. SmartCasings are a small revolution in sausage-making. A liquid alginate layer is applied to the sausage mass and then hardened into a firm structure in a calcium bath. The result is a strong and edible casing that gives sausages a crisp bite. What’s more, this casing is and will remain available in unlimited quantity, and also offers processing advantages. “The stabilising system is based on a complex mix of highly reactive hydrocolloids and starch. 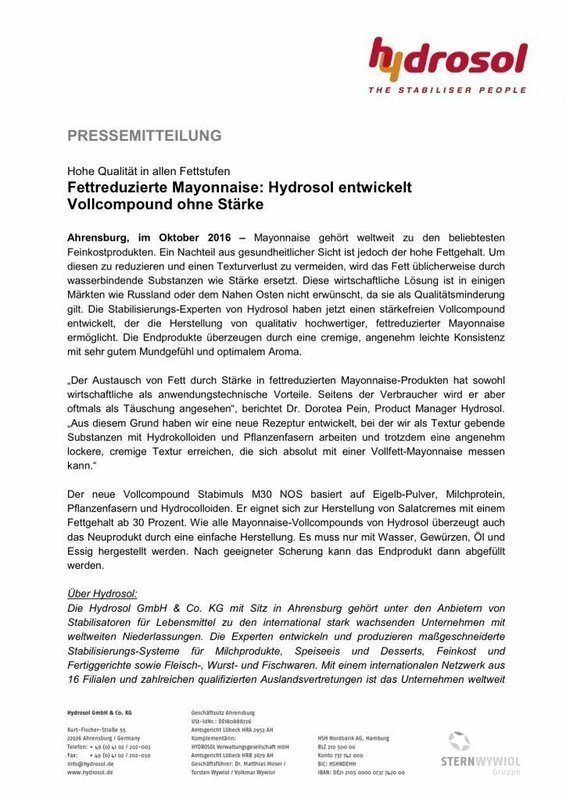 Synergistic effects upon exposure to a calcium chloride solution lead to the formation of a casing with good elasticity and tensile strength,” explains Hydrosol Product Manager Florian Bark. 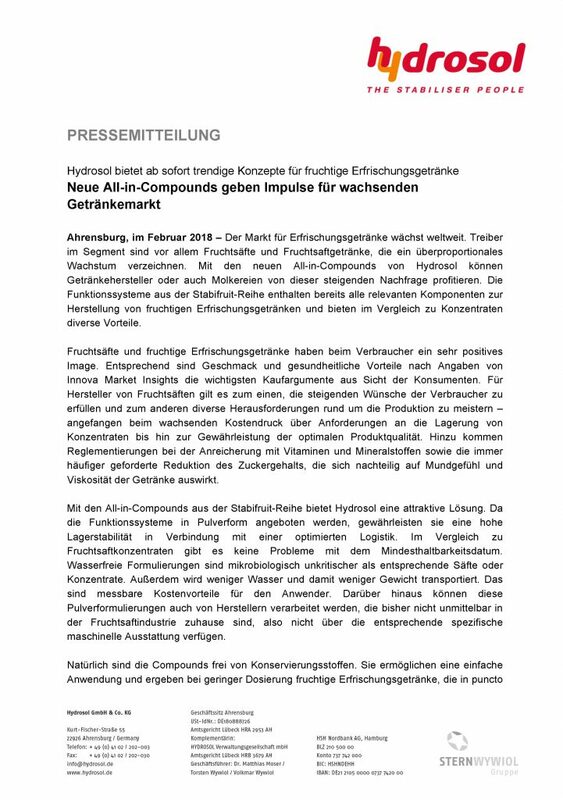 Hamburg, December 2018 – In 1993 Hydrosol entered the market with just one product. Since then, this Stern-Wywiol Gruppe subsidiary has grown to become an internationally leading provider of system solutions in the ingredients business. The company makes hundreds of stabilising and texturing systems for all sorts of applications and markets, and signs point to further growth going forward. 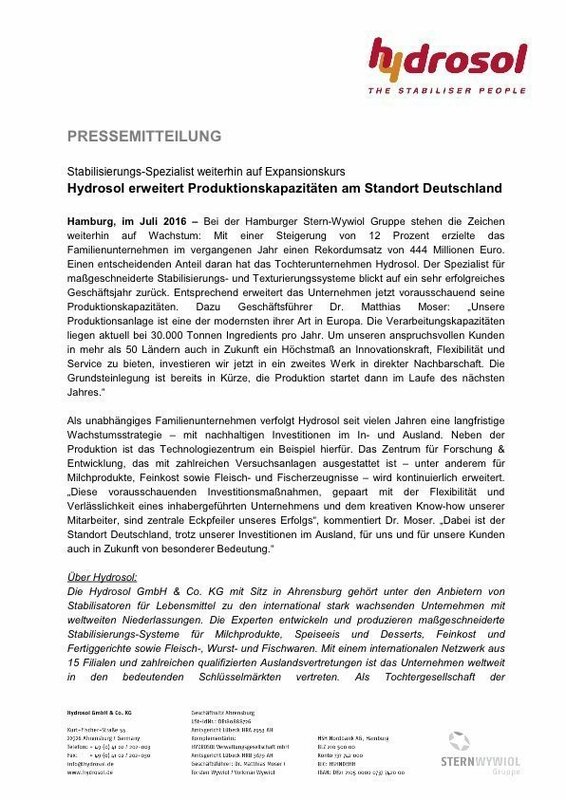 Hamburg, December 2018 – In 1993 Hydrosol entered the market with just one product. Since then, this Stern-Wywiol Gruppe subsidiary has grown to become an internationally leading provider of system solutions in the ingredients business. The company makes hundreds of stabilising and texturing systems for all sorts of applications and markets, and signs point to further growth going forward. Because as Hydrosol CEO Dr Matthias Moser explains, food technology is one of the key technologies and influencer industries of the 21st century. Hamburg, August 2018 – Sugar reduction in foods is a topic of great interest around the world. In Germany, retailers are advertising the lower sugar content of their house brands. In Great Britain, since April of this year there has been a sugar tax on soft drinks. In other European as well as Latin American countries, nutrition traffic lights on packaging alert consumers to the sugar percentage in foods. In India, regulation to this effect is currently being finalised. The main driver for all this activity is the ominous increase in obesity on all continents, that is increasingly being linked to high sugar consumption. It is therefore no surprise that the number of sugar-reduced or sugar-free products is growing rapidly around the world. In just the past five years the number of product launches has more than doubled, from just under 5000 in 2012 to over 10,000 in 2017 worldwide. Soft drinks and dairy products are among the fastest-growing categories. This growth is set to continue, as obesity is a key risk factor for cardiovascular diseases that are a major strain on healthcare systems, and more and more governments are devoting attention to the issue. The new need is “low sugar,” and new solutions from retailers and industry are in higher demand than ever. 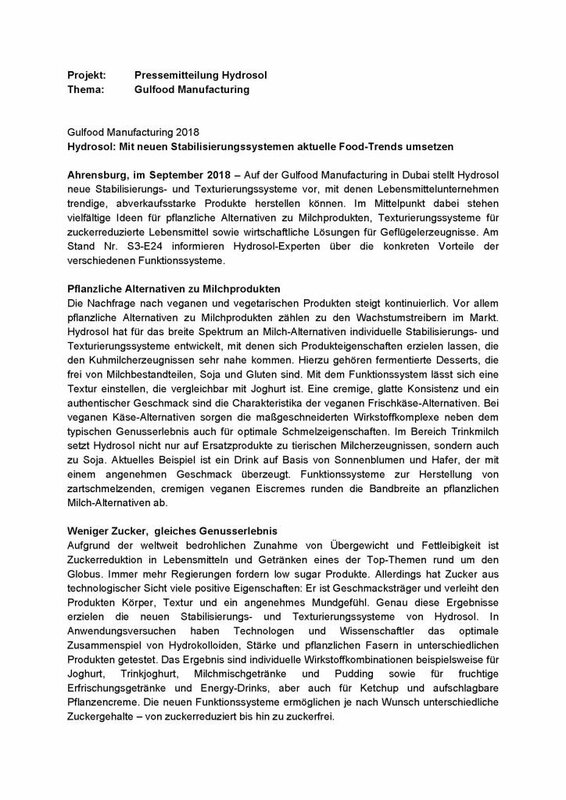 Ahrensburg, September 2018 – at Gulfood Manufacturing in Dubai, Hydrosol is presenting new stabilising and texturing systems that enable food companies to make high-selling trend products. The focus is on the company’s many ideas for plant-based alternatives to dairy, texturing systems for reduced-sugar foods, and economical solutions for chicken products. At booth S3-E24 the Hydrosol team will tell visitors about the benefits of the various functional systems in detail. Demand for vegan and vegetarian products continues to rise. Plant-based alternatives to dairy products are especially strong growth drivers in this market. Hydrosol has developed individual stabilising and texturing systems for a wide spectrum of dairy alternatives, that give them properties very close to those of products made from cow’s milk. These include cultured desserts that contain no milk components, soy or gluten. The company’s functional systems let manufacturers adjust products to get a texture comparable to yogurt. A creamy, smooth consistency and authentic flavour are characteristic of the vegan creamed cheese alternatives made with them. Used in vegan cheese alternatives, these tailor-made ingredient complexes give ideal melt properties as well as the taste and enjoyment consumers want. For milk drinks, Hydrosol works with alternatives not only to animal milk, but also to soy. A current example is a drink based on sunflower and oats that delivers a pleasing flavour. Functional systems for soft-melting, creamy vegan ice creams round out the product line for plant-based dairy alternatives. Given the worrying increase in obesity all over the world, reducing the amount of sugar in foods and beverages is a major global concern. More and more governments are demanding low sugar products, but from a technological point of view sugar has many positive properties. It gives products flavour, body, texture and a pleasant mouth feel. This is just what the new stabilising and texturing systems from Hydrosol accomplish. In application trials, technologists and scientists have found the optimum interplay of hydrocolloids, starch and plant fibre for various products. 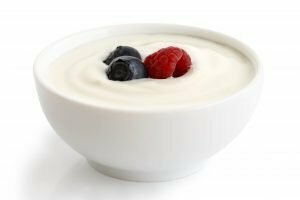 The result is individual ingredient combinations for foods like yogurt, drinking yogurt, mixed milk drinks and pudding, as well as for fruity refreshing drinks and energy drinks, ketchup and plant-based whipping creams. These new functional systems enable different sugar content levels as desired, from reduced sugar to sugar-free. Poultry products make up the world’s fastest-growing meat category, and Hydrosol has developed a wide range of solutions for them. These include injection brines for fresh chicken meat which give increased moistness and tenderness, with outstanding brine retention and individually adjustable yield. There are also functional systems for chicken nuggets, ground meat products and schnitzel. These provide excellent binding and a juicy bite, and allow the use of vegetable ingredients in addition to meat, which opens up many possibilities for innovative product ideas. The portfolio also includes functional systems for the economic production and long shelf life of poultry sausages. 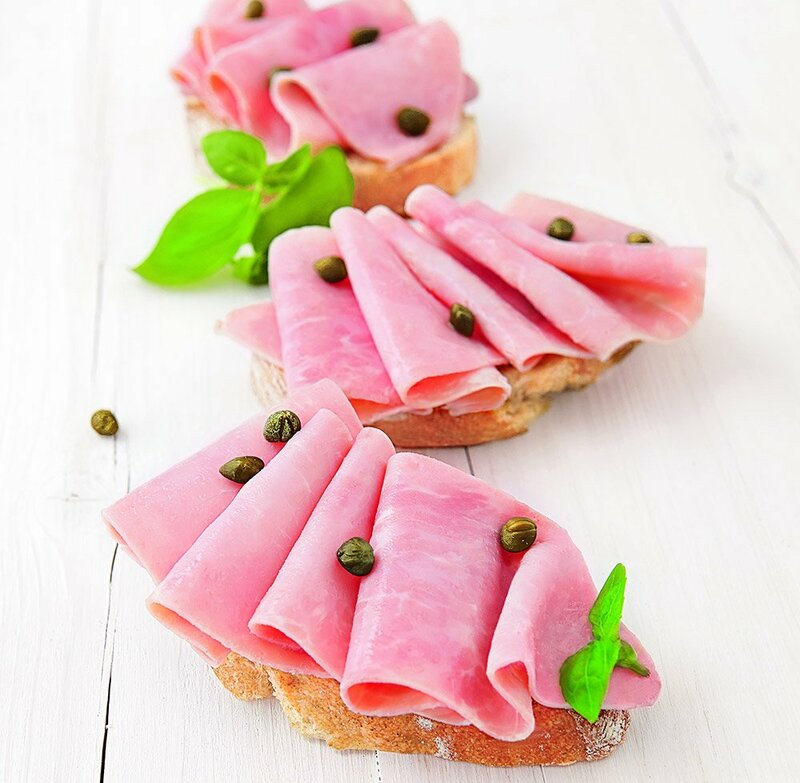 For poultry cold cuts from all-muscle tissue, Hydrosol offers tailored ingredient combinations for high-end premium products as well as cost-optimised recipes. Individual solutions from product idea to packaging. Hamburg, June 2018 – At this year’s IFT Food Expo in Chicago, five sister companies of the Stern-Wywiol Gruppe will be presenting their latest offerings. SternMaid America will present its wide range of customer-specific contract manufacturing services, while sister companies Hydrosol, SternEnzym, SternVitamin and Sternchemie exhibit trend-oriented food ingredients. These include individual stabilizing and texturing systems for vegan products, trendy vitamin and mineral premixes for different consumer demands, clean label lecithins and oils, and innovative enzyme systems for the efficient and economical manufacture of food products. At their shared booth S671 visitors can get customized problem solutions and new inspiration. Hydrosol, a leading international supplier of customer-specific stabilizing and texturing systems, is presenting vegan alternatives to meat and dairy products at the IFT Food Expo. With its all-in compounds for meat alternatives, customers can use standard production equipment to make vegan burger patties and meatballs, meatless nuggets, schnitzel, and filet strips. Hydrosol also offers functional systems for making vegan cold cuts. For the wide spectrum of dairy alternatives, Hydrosol has developed individual stabilizing and texturing systems that give products properties that are very close to those of products made from cow’s milk. In addition to fermented desserts, ice cream, and drinks, this includes vegan cream cheese alternatives with an appealingly smooth, creamy consistency and authentic flavor. Used in vegan cheese alternatives, these functional systems deliver the taste and enjoyment consumers want, as well as the ideal melt properties for pizza and casseroles. SternVitamin is showing how manufacturers of beverages, foods and nutritional supplements can generate new value-add potential. This micronutrient specialist company has also developed special premixes for enriching vegan foods that meet the daily requirements of all important micronutrients. Another focus is health and lifestyle concepts for different target groups and requirements. These include bone health, boosting the immune system, strengthening the cardiovascular system, and beauty support. The new premix for “healthy bones and heart” is just one example, and trade show visitors can test it right at the booth. The premix contains vitamins B1, B12, C, K2 and D3, and is just one example of many different target group concepts that address different life phases of consumers, from childbearing to school, study, professional life and senior years. In addition to beverages, these tailor-made micronutrient premixes add value to teas, snacks, dairy products, baked goods and confections. They can also be integrated into a vegan lifestyle. At IFT enzyme designer SternEnzym is presenting solutions that make food manufacture more efficient and economical. One focus is on new applications for baked goods and dough products, and for avoiding acrylamide. In cookies, the company’s special enzyme systems improve dough workability and cookie structure, while reducing the tendency to form hairline cracks and bubbles. In waffle production, they enable major savings through lower energy expenditure and lower product loss. The multipurpose Pastazym line makes it possible to use cheaper wheat varieties and so keep costs down. The enzyme compounds are suitable for pasta products of durum wheat, common wheat, and mixtures of the two. SternEnzym is also showing Innovase ASP, which prevents the formation of acrylamide in French fries, fine baked goods, bread, coffee, and breakfast cereal. 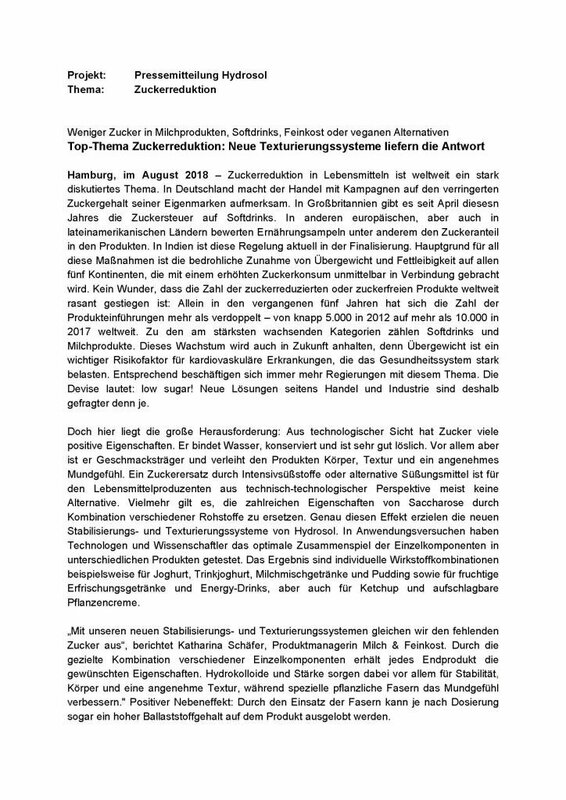 Sternchemie is an international supplier of lecithins and food lipids, and is presenting its declaration-friendly non-GMO products including sunflower and rapeseed lecithin as well as IP soy. 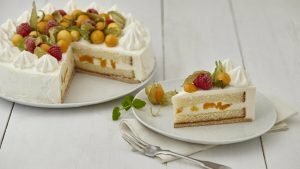 These clean label products are from the company’s own sustainable production and are suitable for baked goods and confections, instant products, and food supplements. Sternchemie offers lecithins in liquid form, as powder, and in hydrolyzed and sprayable versions Another specialty is de-oiled pure lecithin. As a problem solver, Sternchemie develops individual lecithin compounds to customer order, specific to the application in terms of functionality, pricing, and declaration. The company’s second major line of business is MCT oil. This colorless, odorless, flavorless, low-viscosity oil is ideal for many things, from baby food, baked goods, and confections to sports nutrition. Sternchemie also offers powdered versions of MCT. Other products are RSPO SG-certified red palm oil, in high demand as a natural food coloring, as well as coconut milk power for cold and hot dishes, baked goods and confections, and ice cream. SternMaid America offers complete contract manufacturing for powder mixes in the nutritional supplements and food ingredients category. With its own plant in Aurora near Chicago, the company can meet all the needs of American customers. Its semi-automatic powder mixing line uses the latest technology, providing high mixing precision and the flexibility to produce quantities from 1000 to 20,000 lbs. and more. Its specially designed nozzles can evenly spray fluid components onto powder; these can be microcomponents like flavorings, oils, emulsifiers and the like, including fatty and highly viscous fluids in high concentration. Powdered products can be supplied packed in bags, cartons, drums or big bags. In addition, the plant has a canning line for filling precise amounts. SternMaid America’s services range from quality control of raw materials to co-packing to stocking and logistics. Its high quality and hygienic standards are reflected by its many certifications. IFT Food Expo 2018 attendees can learn more about what SternMaid America and its sister companies offer at Booth S671. For us, sharing our knowledge is a huge part of our business. We are happy to have Hydrosol represented with two contributions at the Anuga Food Tec in Cologne this month. On March 20th, Dr. Dorotea Pein, Innovation and Product Manager for Dairy Products at Hydrosol will speak about “foams and aerated products in food industry – with a focus on vegetable fat cream” within the general session on “Food Foams”. Also on March 20th, Dr. Carsten Carstens, Scientific Director, Innovation and Product Manager for Meat Products at Hydrosol will speak about “functional ingredient systems for the production of sustainable meat products”, which is part of a session on “Technological possibilities for producing, functionalising and stabilising ingredients”. 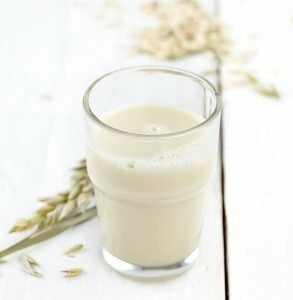 Hydrosol addresses growing demand for vegan dairy alternatives. 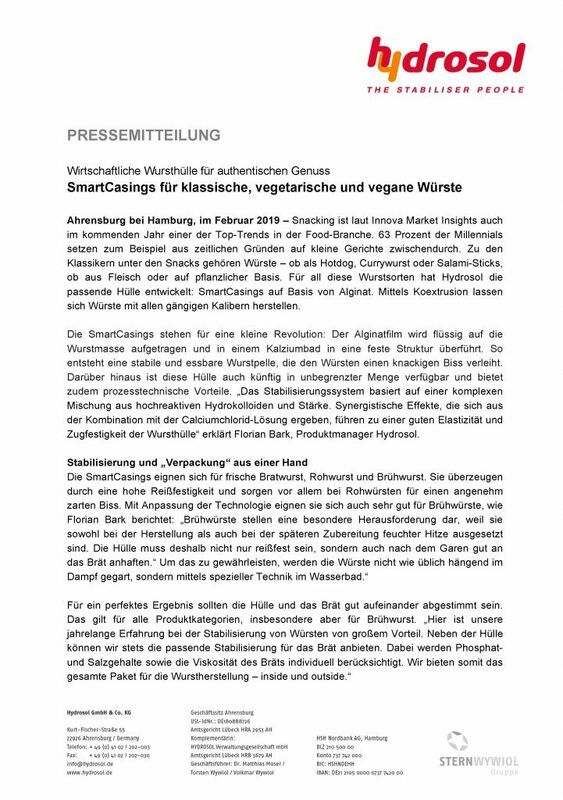 Hamburg, March 2018 – Alternative nutrition forms are becoming more and more popular, and vegan and vegetarian products continue to gain ground, according to s study by market research company Mintel. Meat and milk alternative products long ago stopped being the exception and are more and more becoming standard, around the globe. According to Innova Market Insights, in the last few years Latin America has had the highest annual growth in vegan products at 132 percent, outstripping the next fastest growing markets of Europe (50 percent), Australasia (45 percent) and North America (34 percent). Hydrosol now offering trend-forward concepts for fruity refreshment drinks. negatively impacts the mouth feel and viscosity of drinks. fruit juice industry, and so do not have the specific machinery park. dosages give refreshing fruity drinks with appealing mouth feel, colour, flavour and viscosity. variable. Sugar content can also be reduced without impacting the quality of the beverage. and minerals. This gives manufacturers a custom beverage concept from a single source. economic, logistical and production benefits. 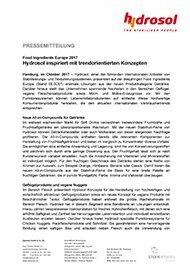 Hamburg, October 2017 – Hydrosol, a leading international supplier of customer-specific stabilising and texturing systems, will for the first time present solutions for its new Beverages product category at this year’s Food Ingredients Europe (Stand 08.0C61). The company will also present exciting new developments for poultry, vegan meat substitute, and dairy and whey products. With these functional systems food manufacturers can easily make products that address current international consumer trends. In the growing worldwide market for soft drinks, fruit juices and fruit drinks are performing especially well. Hydrosol’s new Stabifruit line lets beverage manufacturers as well as dairies benefit from this growing demand. These all-in compounds contain all the important components for making fruit juice drinks, and offer many advantages over concentrates. They are easy to use and store, contain no preservatives, and require only low dosages. The fruit content can be varied depending on the customer’s wishes. Individual enrichment with vitamins and minerals is also possible. 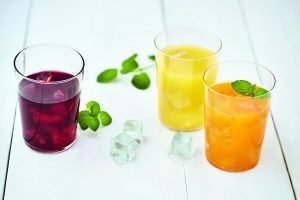 A portfolio of fruit flavours is available including orange, raspberry, banana and currant, so that the new Stabifruit line of all-in compounds provides the basis for a wide range of fruit drinks whose mouth feel, colour, taste and viscosity leave nothing to be desired. In the meat category, Hydrosol is presenting concepts for making high-quality, economically attractive poultry products as well as a new concept for vegan products with meat-like texture. Poultry products make up the world’s fastest-growing meat category, and Hydrosol has developed a wide range of solutions for them. These include injection brines for fresh chicken meat that give increased moistness and tenderness, with outstanding brine retention and individually adjustable yield. Hydrosol also offers special functional systems for chicken nuggets, ground meat products, and schnitzel. These provide excellent binding and a juicy bite, and allow the use of vegetable ingredients in addition to meat, opening up many possibilities for innovative product ideas. The portfolio also includes functional systems for the economic production and long shelf life of poultry sausages. For poultry cold cuts from all-muscle tissue, Hydrosol offers tailored ingredient combinations for high-end premium products as well as cost-optimized recipes. 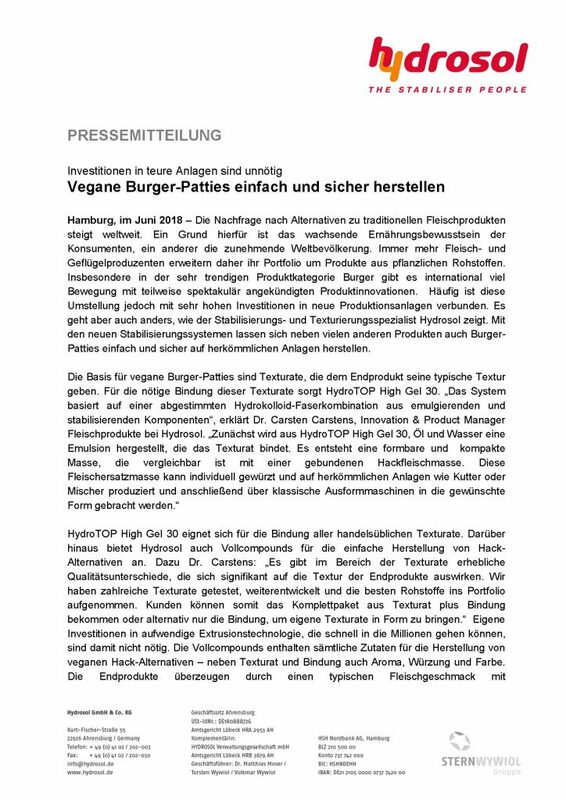 In the growing meat alternatives category, Hydrosol is presenting new stabilising and texturing systems for the manufacture of products like vegan nuggets, burgers, meatballs or “filet strips.” The end products deliver the accustomed bite and a similar texture to meat, and can be pan or deep-fat fried without problems. They can also be used as ingredients for trend-forward convenience solutions. Another plus point is that they contain no flavour enhancers or phosphates. Sustainability is an important issue for consumers. In the meat category, Hydrosol helps address it with meat extension stabilising systems that allow products to be made with substantially less meat. For example, these might be hybrid products with meat or fish and vegetables. This makes it possible to conserve the valuable resource of meat. Hydrosol also offers special concepts for the dairy industry. One example is the sustainable marketing of excess whey from cheese and quark production. 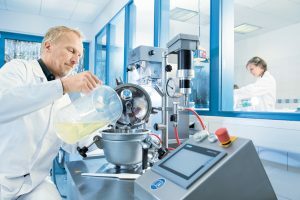 With the company’s new functional systems, cheese and quark makers can efficiently use their large amounts of leftover rennet and acid whey to bring very different new products to market. Rennet whey can be used to make products like pudding desserts, beverages, cultured desserts and sour cream. Acid whey can serve as a base for yogurt alternatives. A great advantage in marketing these products is the good image of whey, specifically whey protein, which is recognised as having excellent nutritional properties. In fact, whey protein is nutritionally superior to protein from whole milk or soy. Proteins are more and more important in new product development, and have a wide range of possible uses. According to market studies, dairy products are by far the leading category in high-protein product launches. There is strong demand for yogurt and drinking yogurt in particular. Hydrosol has developed special functional systems that let manufacturers make a variety of high protein products. For Greek-style yogurt, which is growing faster than other categories on the German market, the company offers a texturing system using casein that is declaration-friendly and so meets the demand for clean label products. The fat content is variable from zero to ten percent, and the recipe and texture can be individually adjusted to the customer’s preference. Hydrosol has also developed a stabilising system for making gelatine-free yogurt and drinking yogurt with high protein content. It contains milk proteins, hydrocolloids and vegetable fibres, and allows the individual adjustment of texture and a pleasant mouth feel. Ahrensburg, September 2017 – With revenues of 464 million euros, the Hamburg-based Stern-Wywiol Gruppe again experienced double-digit growth in 2016. 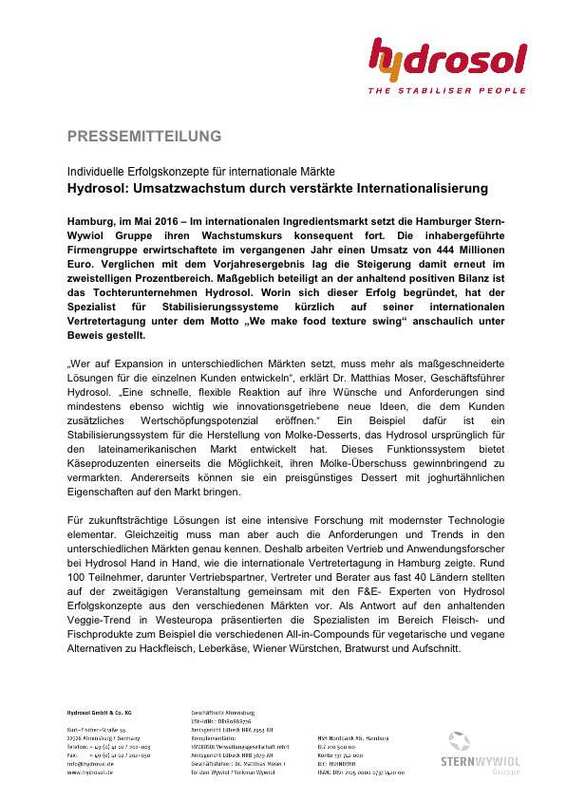 Its Hydrosol subsidiary made an important contribution to this continued positive balance. A specialist in stabilising and texturing systems, in recent years the company has grown to become one of the leading suppliers of stabilising systems on the international market. In Europe the company is in the top 3 in the category. Hydrosol has made a name for itself worldwide with custom solutions for dairy products, deli foods, meat and fish products. Most importantly, the company has demonstrated a nose for leading-edge trends. As early as 2009 Hydrosol presented clean label solutions at F1 Europe. 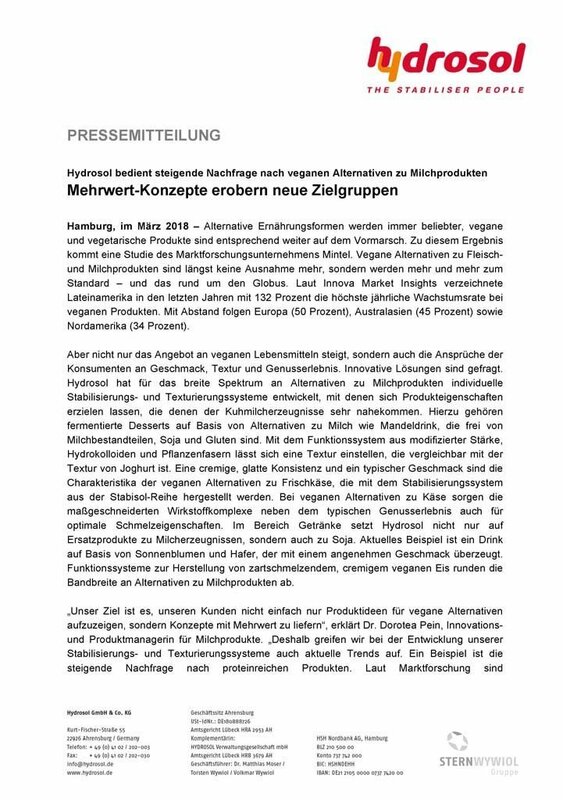 The Market Insights organisation presented the “Flexitarian Effect” as one of the top trends in 2016, but Hydrosol had already been offering all-in compounds for vegetarian and vegan meat alternatives since 2014. 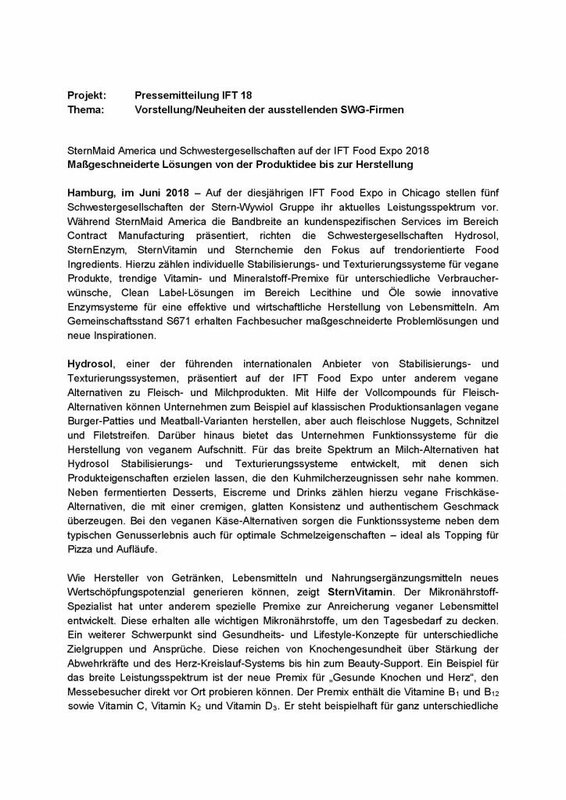 Current developments by this creative Ahrensburg company include stabilising and texturing systems for the production of vegan nuggets, burger patties and schnitzel, as well as functional systems for the economic production of cheese preparations and recombinations. With new, tailor-made solutions for the manufacture of poultry products, Hydrosol customers can participate in the worldwide growth of this segment. Another innovation is functional raw materials complexes for the sustainable processing of rennet and acid whey into high-value dairy products like pudding desserts, beverages and fermented products that can be used as alternatives to yogurt and sour cream. A video on the newly designed website www.hydrosol.de gives a look at the varied activities of Hydrosol R&D. 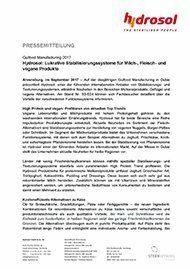 Ahrensburg, September 2017 – At this year’s Gulfood Manufacturing in Dubai, Hydrosol, a leading international supplier of stabilising and texturing systems, will present attractive new products for dairy, poultry, and vegan alternative products. At booth S3-E24 trade visitors can learn about the benefits of the various formulations in detail. Vegan and dairy products with high protein content are internationally growing food trends. Hydrosol has developed a series of product concepts for both areas that open up many possibilities. For meat alternatives, the company has new stabilising systems for the production of vegan nuggets, burger patties and schnitzel. In the dairy alternative area, as one of the leading international suppliers of solutions for vegetable whipping cream, Hydrosol offers various functional systems for making products like non-dairy yogurt, vegan cream cheese and vegetable cooking and whipping cream. The company is also presenting its latest products for hot regions at the Dubai trade show. With the help of special stabiliser and texturising systems, countries with low milk production can also profit from the accelerating high protein trend. Hydrosol’s offerings for protein-rich dairy products comprise solutions for Greek yogurt, drinking yogurt, cocoa drinks, pudding and dressings. They can be made from recombined milk very successful. In addition, they can be enriched with vitamins and minerals in order to address different customer needs and offer added value. Whether for bread spread, snack fillings, pizza or ready meals, the new ingredient mixes for recombined cheese alternatives offer economic, manufacturing, and quality advantages. The long curing times hard and sliced cheeses require are a cost factor, and in hot regions volumes are limited by the low availability of fresh milk. Hydrosol’s alternatives deliver convincing product quality. On pizza, the recombined cheese product is satisfyingly stringy and enables individual flavour and colour adjustment. For spreadable products, selected Hydrosol systems let manufacturers set the desired texture from liquid to gelling. Snacks with alternative fillings are highly stable in frying and baking. They form well and are freeze-thaw stable. Poultry is the world’s fastest-growing meat category, and producers can get the most out of this potential with Hydrosol functional systems. The portfolio includes solutions for the economic production and long shelf life of poultry sausages, plus injection brines for raw chicken meat that give a higher yield in tender, moist meat. There are also stabilising systems for the cost-saving production of reconstituted chicken breast and poultry cold cuts. 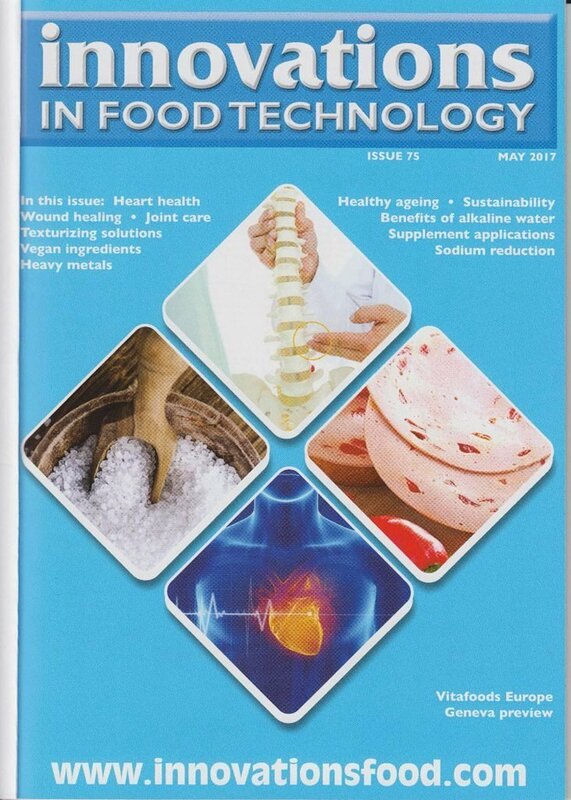 Special functional systems provide good binding of animal and vegetable constituents for products with reduced meat content. 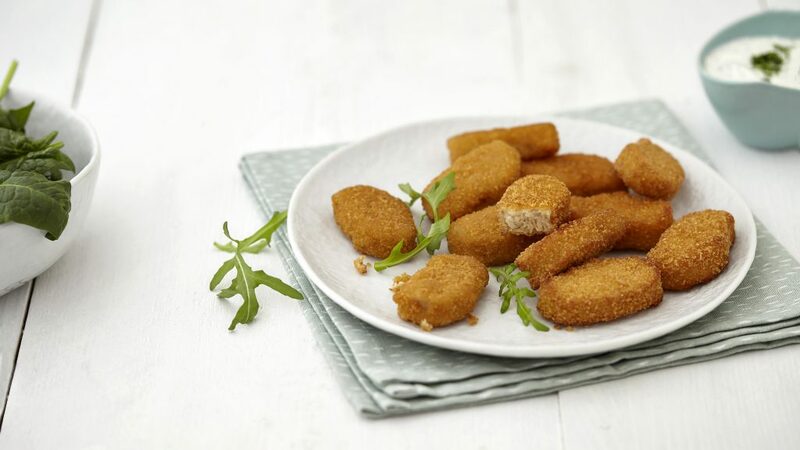 They have an appealing meat-like texture and are very suitable for nuggets, burger patties and schnitzel. Visitors to the Hydrosol booth can also learn about the benefits of customer-specific stabiliser and texturing systems. 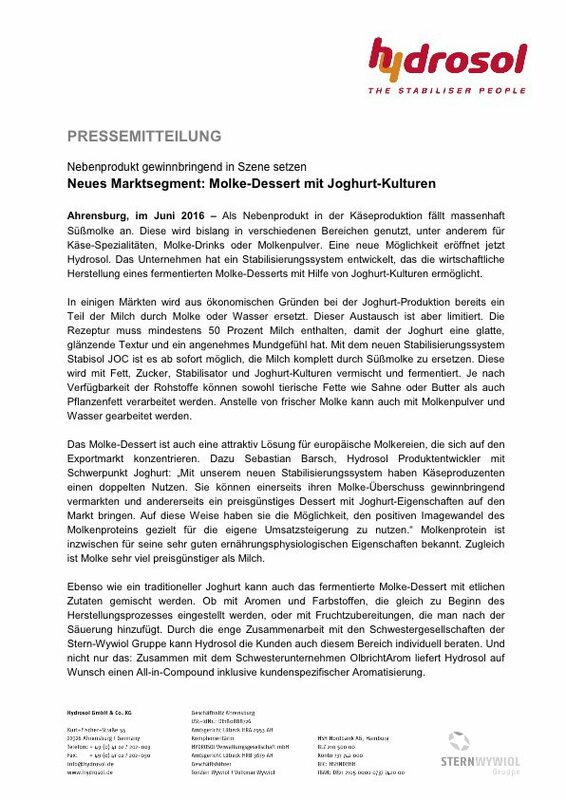 Ahrensburg, August 2017 – The manufacture of one kilogram of cheese results in nine kilograms of whey as a by-product. The amount of whey left over is correspondingly high in cheese-making countries. The US is in the lead with over 48 million tonnes per year, followed by Brazil, Turkey and Russia with five to seven million tonnes. Given these volumes, which have risen steadily over the years, dairies are faced with a major challenge, since disposing of whey is just as costly as converting it into powder. Hydrosol now gives cheese makers new possibilities. With Stabisol JOC stabiliser and texturing systems, rennet and acid whey can profitably be made into new products. Whether made of rennet or acid whey, the end products feature appealing mouth feel and creamy texture. “The fat content of the products can be adjusted either with normal milk fat in the form of cream, or with vegetable fat,” said Dr. Pein. “The desired viscosity can be achieved using our highly functional stabiliser and texturing systems.” Like yogurt, the whey alternatives can be mixed with various ingredients, such as flavourings and colours added at the beginning of the manufacturing process or fruit preparations added before filling. Through its close cooperation with its sister companies in the Stern-Wywiol Gruppe, Hydrosol can offer its customers individual solutions in this area. With its sister company OlbrichtArom, stabiliser specialist Hydrosol can also offer all-in compounds that include customer-specific flavouring. New vegan nuggets: enjoyment meets convenience. 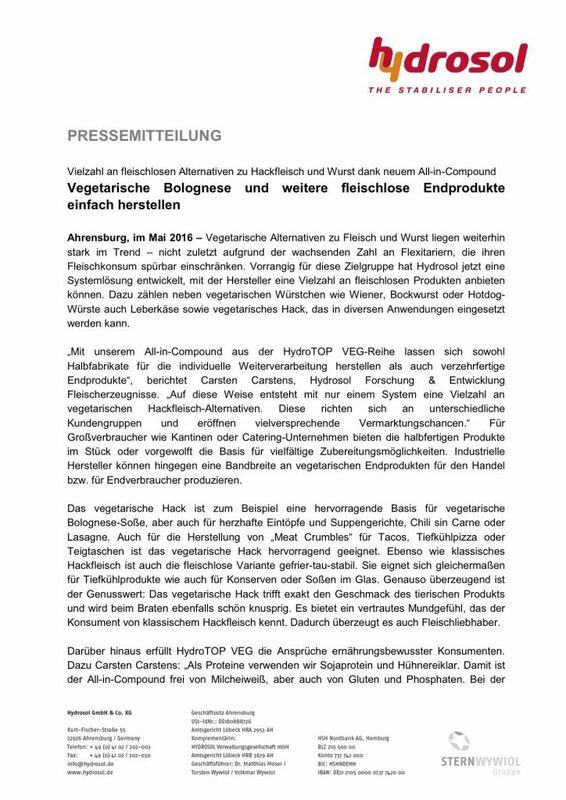 Ahrensburg, May 2017 – The boom in vegan meat substitutes continues. A study by market research institute Mintel shows that the greatest growth is among flexitarians with reduced consumption of meat. According to the study, last year 18 percent of Germans ate more meat alternatives than the previous year. Mintel talks of a paradigm change, as niche vegetarians turn into mass-market flexitarians, and the market potential for meat alternative products is correspondingly high. But such products are only successful if their taste and consistency compare favourably to the meat product, and if they offer health benefits and ideally also address the ongoing convenience trend. 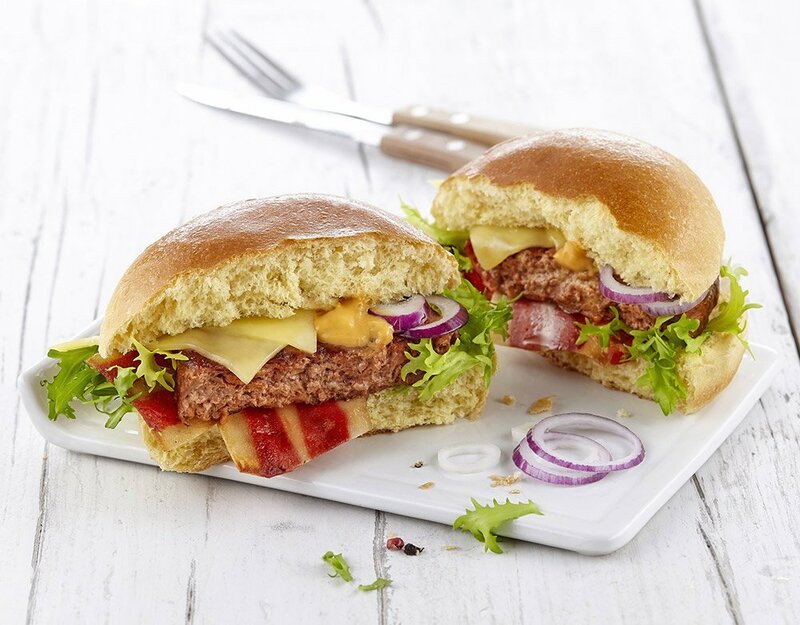 Hydrosol has developed a new stabilising and texturing system that lets manufacturers of meat alternatives address the wishes of ever broader target groups. Vegan nuggets suitable for hot consumption are a current example. What’s special about these nuggets is their meat-like texture, which is achieved with the aid of HydroTOP High Gel. “The system is based on a specific combination of hydrocolloids and fibres that act as emulsifying and stabilising components,” explains Dr Carsten Carstens, head of Product Development for meat and sausage products at Hydrosol. “First an emulsion is made with HydroTOP High Gel 30, oil and water. This stabilises the hydratised texturate through thermoreversible gelling, meaning that heating the formable mass turns it into a product that is pleasantly firm to the bite.” Treating the texturate with the HydroTOP emulsion creates a formable, slightly sticky meat analogue comparable to a ground meat mass used for meatballs and the like. Thanks to this adhesive property, vegetables with smooth surfaces like corn or peas can be worked into the mass without problems. The meat substitute mass can be individually seasoned and produced continuously on a conventional line. HydroTOP High Gel 30 is suitable for all standard commercial wheat, soy and pea protein-based texturates. “In application, the synergies and interactions between HydroTOP and the protein texturate are used to full effect,” reports Dr Carstens. 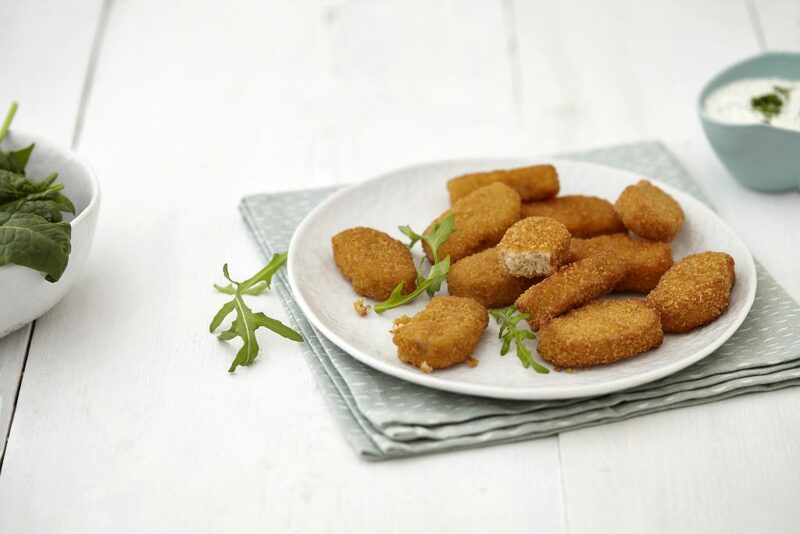 “High Gel 30 turns the fibrous structure of the texturate into a meat-like structure.” The vegan nuggets can be pan or deep-fried, and in addition to their texture they offer another clear advantage – they are very declaration-friendly. The products aren’t just vegan, they can also be advertised as free of soy and gluten. Furthermore, they use neither flavour enhancers nor phosphates. Besides vegan nuggets, manufacturers can use HydroTOP High Gel 30 with the texturates from the Hydrosol Stabiprot series to make many other products. Examples include vegan burgers and patties, as well as vegan schnitzel with breading. All products can be deep-frozen without problems. In addition, with High Gel 30 all other formed ground meat, fish, poultry, diced ham and similar products can be made at low cost with excellent quality. The meat and fish products have a firm bite, are juicy, and retain their shape. Complete solutions for meat, sausage and plant-based alternatives. 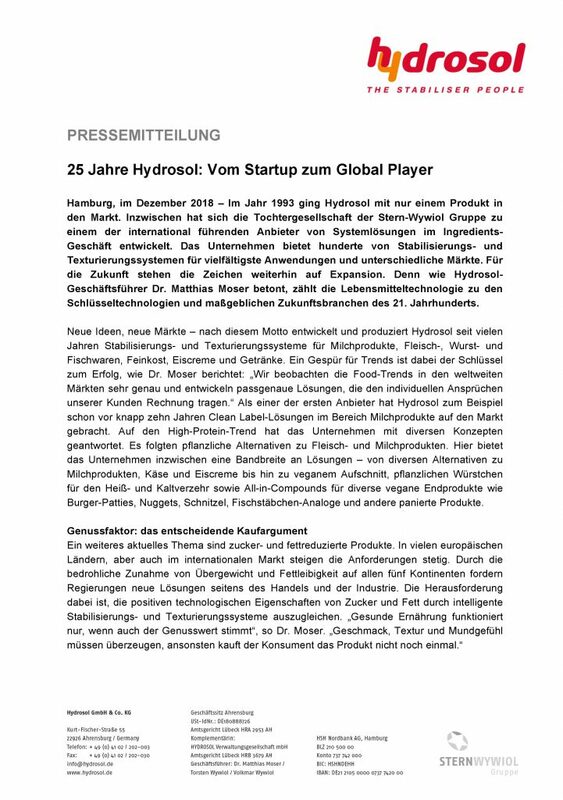 Hamburg, December 2018 – In 1993 Hydrosol entered the market with just one product. Since then, this Stern-Wywiol Gruppe subsidiary has grown to become an internationally leading provider of system solutions in the ingredients business. Meat substitutes are enjoying growing popularity. The success of modern vegan and vegetarian products is due to the fact that they offer consumers familiar flavours and textures without using meat.